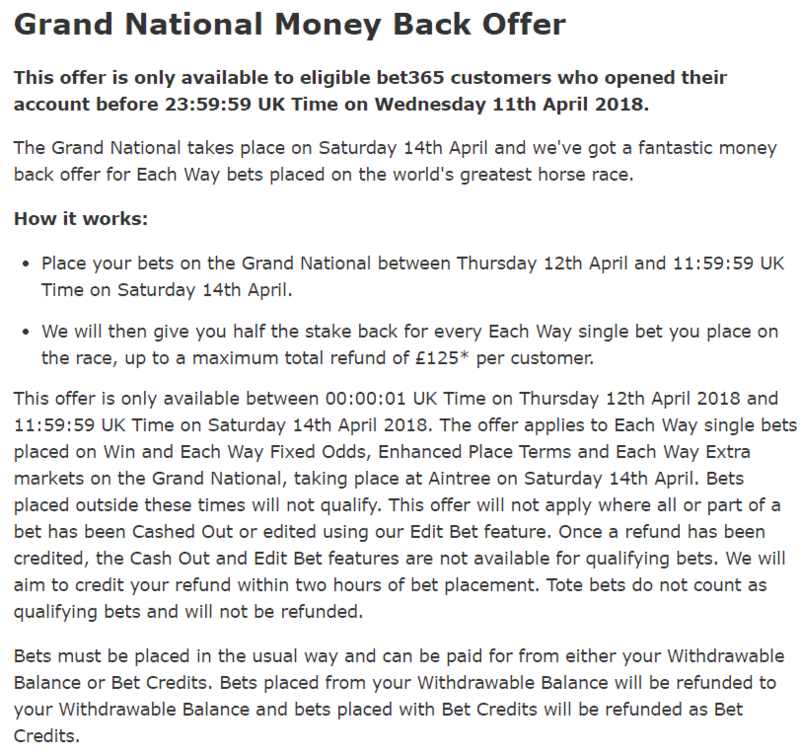 It's the biggest race in the British racing calendar, the 2019 Randox Health Grand National at Aintree, and so it is the weekend where friends, family and those people you only hear from once a year request a tip in the most impossibly deep contest of the season! As regular readers will know, I've long dispensed with sensible approaches to trying to isolate the winner, preferring instead to go full on guerilla contrarian. Results from this approach have been mixed, but then they would be whichever approach is taken and, at least this way, we're dealing in fat-priced contenders rather than the sharp end of the market. That's important in a race where the talk often overtakes the form, as evidenced by an average SP for the top six finishers in the last five years of 27.5/1. Yum! Indeed, in spite of the last two winners averaging only 12/1, the previous five returned 33/1, 66/1, 25/1, 25/1, and 33/1. Clearly, bravery - likely mitigated by splitting stakes between two or three (or four or even five) runners - is the route forward. This is difficult. For a long time, the Grand National trends were sacrosanct: proven stayers, proven jumpers, proven in a big field, proven touch of class, aged 8 to 12, job done. But the race has changed. Each of a reduction in the distance, a (necessary) softening of the fences, and the encroachment of discretionary handicapping (where the official handicapper gets to allocate a unique 'Aintree' rating to a horse, which is different from its rating for all other steeplechase races) has levelled the playing field. Where ten years ago we might have a fairly confident shortlist of eight or ten horses, now it is hard to categorically rule out that many runners. Quite simply, and on many levels this is great for the broader appeal of the sport beyond us aficionados, in my opinion it has become the lottery that many once incorrectly claimed it was. Getting back to the matter at hand, as I wrote, the race has changed markedly in complexion in the past seven or eight years. Below are some ten-year trends, but mostly five-year and even three-year (top six finishers) trends. That's because the distance has been shortened and the discretionary handicapping increased during that time. Let's start with age. The ten year mean average winning age is 9.5. The ten year median (ranking the winners in age order and taking the mid-point) is also 9.5. However, the five year average is just 8.8, and the median 8. That's because the last four winners have been aged 8, 9, 8 and 8. It's a tiny sample and it could very easily be coincidence. But that sample aligns with the reduced race distance and the height of discretionary handicapping. And it's not just winners. In the last ten years, 9 of the 20 top two finishers were aged 8 or 9; in the last five years, seven of the ten top two finishers were that age. And yet eight-year-olds accounted for just 41 of 196 horses to line up in the Nash since 2014. That's 60% of the winners from 21% of the runners; and looking at 8-9yo's, it's 53% of the runners taking in 80% of the winners and 60% of the places. In short, I believe that youth is more material in the Grand National than before and I will happily cast aside any horse older than 10. At the other end of the spectrum, horses aged six (now ineligible for the race) and seven have failed to register a placed effort from 64 to try since 1997. Ramses de Teillee is not for me. From a whittling perspective, that only takes out roughly a quarter of the field (down as far as The Young Master, #44) and there remains a decent chance we've ditched the winner! An interesting route in are official ratings. In theory, if discretionary handicapping has made a material difference, we should see winners and placed horses from all over the ratings scale. The ten year average winning rating was 149.4, with the median 149. The five year average winning rating was 149.8, and median 148. But that doesn't tell the whole story, which is this: in the last six years, horses have won the Grand National from ratings as high as 160 (the magnificent Many Clouds) and as low as 137 (Auroras Encore). Consider that, prior to discretionary handicapping, the highest winning rating since 1997 was Lord Gyllene's 149; and since it was introduced we've seen five winners rated 150+ since 2010 (nine years). The Irish had a good record in the National. From just before the turn of the century, the likes of Bobbyjo, Papillon, Montys Pass, Hedgehunter, Numbersixvalverde and Silver Birch gave them a near stranglehold on the great race. But then came discretionary handicapping and a relative drought, which in recent times led Gigginstown Stud and Ryanair supremo, Michael O'Leary, to an acerbic outburst aimed at the capo di 'capping. Given that O'Leary's colours have been worn to victory twice in the last three years, methinks the laddy doth protest too much! But, after Silver Birch (2007) and before Rule The World (2016), the Irish went 0 from 32 (just two places). That has changed again now, in what might be an interesting way. Look at the top six finishers from the last three renewals of the Aintree Grand National. Focus on the UK/Ire column, but also on the Going column. See anything? There appears to be a strong correlation between the state of the turf and nation that has fared overwhelmingly better. Again, this might be no more than a confusing coincidence; but it could be material. Frustratingly, the current going forecast is right on the cusp. I'm erring towards good to soft in my own mind, but the evidence of the track and the weather 'twixt now and race time will be a far better indicator. Let's just tease out a couple of points from the above. The first thing to say is that in each of the last five renewals one or other side of the Irish Sea has been dominant, taking at least five of the top six spots. When the going has been good to soft, as it has been in three of the five renewals in the that time, UK-trained horses have claimed 16 of 18 top six positions; when it has been softer, Ireland has bagged ten of the 12 top six places. It's up to you whether you believe that's relevant or just a coincidence. I tend to think there might be something in it: after all, in a typical season (not that this has been a typical season), Irish-trained horses will race on much more deep ground than their British counterparts. It is important to contextualise such observations in terms of the horses that ran. In the soft and heavy pair of Nationals, Ireland saddled 29 runners to UK's 48. Thus, their 83% of the places came from just 38% of the runners. 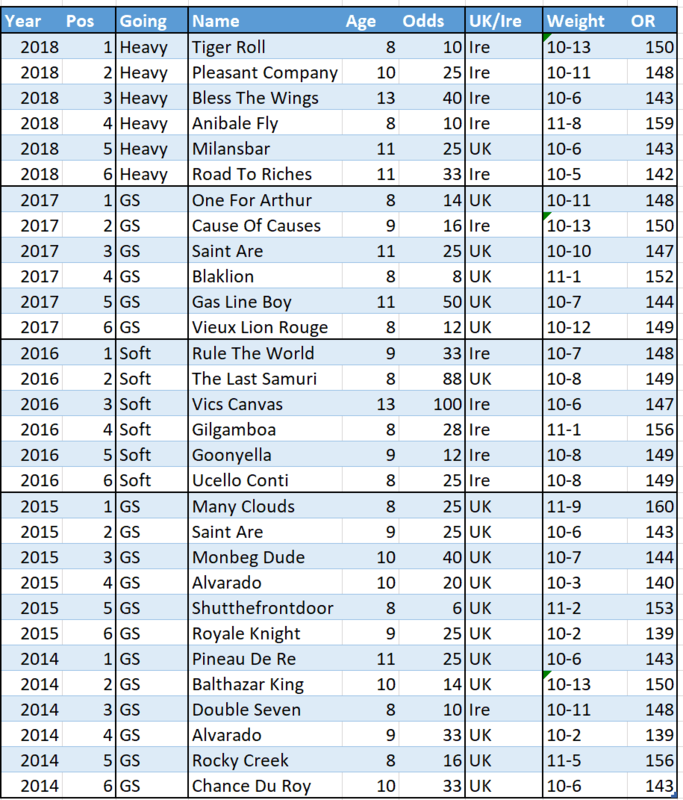 In the good to soft trio of renewals, UK saddled 89 of 119 runners (one French entry, 29 Irish), which was 75% of the fields from which 89% of the top six emerged. It might also be worth noting that when the ground has been at its softest, two 13-year-olds have snuck into the frame ramping up the average age of top six finishers to 9.7. When it's been drier, that average is just 9.2. Indeed, last year's heavy ground renewal has bumped up the overall age average notably. From the above, there is absolutely no doubting the credentials of the Festival Cross Country Chase as the leading Grand National trial. Winners of that race have a superb record at Aintree. Otherwise, the Gold Cup is a solid trial, last time hurdlers are noteworthy, and the form of more run-of-the-mill staying handicap chases should not be overlooked. The Irish and Haydock National trials have a fairly moderate record in recent times. Two of the last five National winners also won last time out. 16 of the 20 top four finishers finished top six last time out. All of the last five winners had run beyond three-and-a-quarter miles, and 18 of the 20 top four finishers had won beyond three miles. - A horse at a price! Every horse from Jury Duty up is rated 151+. 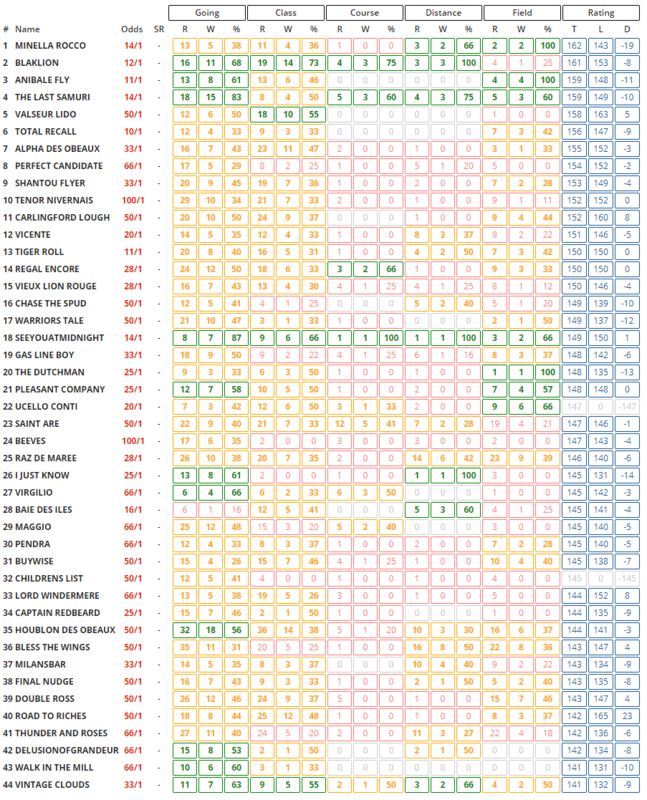 Strictly speaking then they should be eliminated, but I think I'd want to include those rated 153 or lower, which still excludes the top 16 at the five day stage, including Anibale Fly (gulp) and Tiger Roll (double gulp). There is a good chance that Tiger Roll just wins. He was imperious in the Cross Country and, as the data above relating to that race show, dismissing that as a form line is reckless in the extreme. You need luck to win a National and, if Tiger Roll gets past the Chair on the first circuit, the reigning champion will take a heck of a lot of beating. Plenty will want to oppose him - he's not exactly a working woman's or househusband's price, in a spin on the dated vernacular - but he has the most solid and obvious claims of any runner in this race for many a long year. He probably merits at least a saver bet. Lake View Lad would be a fantastic story for Borders trainer, Nick Alexander. His staying on second in the Ultima was eye-catching, but he lacks either a standout class piece of form or an attractive enough price to justify a bet. He can still be involved in the finish, of course, he's just not for me. I think on good to soft or better ground, Dounikos is pretty interesting. Gordon Elliott's Grand National record is superb: his 16 runners in the race have yielded two winners, a second and a third - and a winner, second and third from six runners in the last two years! Elliott has plenty entered, not least of which is the jolly, but I think this fellow is over-priced as an eight-year-old last day winner. As we move into what might be 'the zone', I really wanted to lob Monbeg Notorious; but the memory of Rule The World, a Gigginstown horse with a quirky back story who won in 2016, made me look again. This 8yo Milan gelding won the Thyestes Chase last season, as well as finishing second in a Grade 1 novice at the Punchestown Festival, before losing his way somewhat this term. That was high class form and, if he's been aimed at this all season (ran easily his best race last time, "kept on well, never nearer") and if he gets some luck in the run, he might be Rule The World mark II. He's exactly the sort of contrarian play this article needs! More obvious is Jury Duty, who won on his travels in America in October and who also prevailed on his sole spin since, last month in a small field nondescript rated chase. He too fits the eight year old last day winner profile of the last two National victors, and he's getting backed. Vintage Clouds' form ties in with Lake View Lad on their running behind Beware The Bear in the Ultima Handicap Chase at the Festival last month. The Sue Smith-trained nine-year-old is more stoutly bred and has more staying form. Both are owned by Trevor Hemmings, who has tasted National success with Many Clouds, Ballabriggs and Hedgehunter since 2005. He should run a bold race. And that leaves Walk In The Mill, trained in Dorset by Robert Walford. Though I'd love a small trainer from the county of my birth to win the most famous race in the land, I'm not sure this Walk In The Park (who else?) gelding will stay and, besides, I'll be cheering another Dorset trainer's runner: Regal Encore from the Anthony Honeyball yard. Naturally, there are about thirty others with chances..! Forty of 'em, running more than four miles, jumping thirty fences. Even in this mildly diluted variant of the fierce test of yore it is still a hugely demanding ask, and one which places a degree more emphasis on speed as well as abundant stamina and acceptable jumping ability. If the ground is good to soft or quicker, I want to be with Anibale Fly, Vintage Clouds, Dounikos and Monbeg Notorious. If the ground is soft or slower, I want to be with Vintage Clouds, Lake View Lad, Monbeg Notorious and Jury Duty. But this is an anti-preview, so I'm just going to back the biggest priced horses from those lists and see where it gets me: Devil take the hindmost! Grand National Betting Suggestion: Back either Monbeg Notorious (66/1) or Dounikos (40/1) with as many places as you can get. Chuck in Vintage Clouds (14/1) and/or Anibale Fly (14/1) if you want a more conventional contender. p.s. if you want to spice up your Aintree interest, how about a bit of Colossus action? It's pool betting, with cash out, syndicates and consolations in the win pools. Check out this post to learn more about it. One For Arthur became King of Aintree, as he stayed on powerfully to land the Grand National in thrilling fashion. The Gigginstown pair of Roi Des Francs and Rogue Angel set the pace for much of the race, tracked by the heavily backed favourite Blaklion. As the front duo began to feel the pinch, Noel Fehily took up the running on the strong-travelling market leader, and looked to be making a break for glory. But at the second last it was One For Arthur that swept to the front, with Cheltenham hero Cause Of Causes launching a brave challenge. At the elbow the winner had pulled three lengths clear, and maintained that advantage all the way to the finish. A brave Cause Of Causes galloped all the way to the line for second place, whilst Saint Are stayed on well to pip Blaklion for third. It was a first Grand National win for Scotland since Rubstic in 1979. The winning trainer Lucinda Russell, was bursting with pride when saying of the success: “I am so proud of the horse. He jumped fantastically and I thought Derek gave him a great ride. He has done us proud, he has done Scotland proud and he has done everyone at the yard proud. It was a wonderfully cool ride from Fox, who sat well off the strong pace, timing his challenge to perfection. The victory was especially sweet, as he had only just returned from injury to make the ride. He fractured his left wrist and right collar bone in a fall last month, and spent three weeks in Jack Berry House, undergoing intensive treatment at the rehabilitation centre. Though only half the field finished the race, it was fantastic to see all 40 runners return home safe and sound. Of the leading pre-race contenders that failed to place; Vieux Lion Rouge again appeared to find the National trip beyond him, finishing sixth. Very much in touch three from home, he was almost 30 lengths adrift at the finish. Top-weight and last year’s runner-up The Last Samuri was unable to cope with the burden of 11-10, and trailed home in 16th place. Definitly Red was badly impeded at Becher’s first time, and had to be pulled-up shortly after. Gold Cup fifth Saphir Du Rheu only made it to the 11th fence, and More Of That failed to last out the marathon trip, being pulled-up by Barry Geraghty at the last. Of the top 15 finishers, only Blaklion carried more than 11 stone, with the first three home carry 10-11, 10-13 and 10-10. Despite all the talk of classier renewals and handicap-compression, weight remains a vital factor in winning the World’s greatest steeplechase. Away from the National, there’s a need to mention the fabulous Aintree experienced by Colin Tizzard, owners Ann and Alan Potts and their jockey Robbie Power. Finian’s Oscar and Sizing Codelco were winners on the day, adding to Pingshou and Fox Norton a day earlier. It’s been an especially thrilling period for the owners, following on from the glorious success of Sizing John in the Gold Cup. They have much to be excited about. Aside from the Grand National itself, which is previewed here, there are some cracking contests on Saturday's Aintree Day Three card, writes Rory Delargy. Duke Street missed the cut for a couple of options at Cheltenham, but didn't get a much easier task when turned out for Kempton's consolation meeting on the Saturday of Festival week. There he ran into Brio Conti, who looked a horse of real potential when winning; and if you weren't convinced of the value of the form, third placed Dream Berry was an excellent second in the opening handicap here yesterday. That suggests Duke Street remains on a lenient enough mark, and while his stamina for three miles must be taken on trust, Richard Newland was reported as leaning towards the Pertemps for his Cheltenham target, suggesting that his trainer believes he'll stay. Barney Dwan fared much the best of those who met in the Pertemps Final, and he should have the best of it again on revised terms, but one who may do better than he did there is Golden Doyen, who looked very rusty on his first run since October (looked fit enough), and is capable of leaving that form behind. Finians Oscar is tempting given the tremendous day Colin Tizzard has enjoyed on Friday, and he looks like a top-notch jumper in the making. That said, the bare form of his wins is easy enough to crab, and he's looked more impressive crossing the last than he has at the line when winning at Sandown and Exeter on his last two starts. Still, he has been winning races at a time when many observers have highlighted a general dip in the stable's fortunes, and it's hard to knock an unbeaten novice who promises so much. This represents his proving ground, and he will silence any lingering doubts if winning impressively here. Brio Conti could not have been more impressive when winning in handicap company at Kempton the day after the Cheltenham Festival, and he looked out of the top drawer given he didn't come off the bridle before hitting the front at the last. He's clearly clicked now, but although he must be one to keep onside, an 11lb rise for that still leaves him shy of Messire des Obeaux and Finians Oscar on official ratings. The former is exposed now, but deserves his mark of 146, while Finians Oscar's 149 is a bit more dubious given it stems from a Tolworth Hurdle which hasn't worked out. Of the others Lough Derg Spirit is short enough on what he's done, but could improve, while Le Breuil looks exciting, but hails from a yard whose runners at this meeting so far have all (A Hare Breath aside) run poorly. In terms of value, Messire des Obeaux must be the bet at 13/2 for all there are "sexier" runners. There was a big shock in this last year when Maggio routed his field, and there may be another surprise in store, as the market leaders look vulnerable. Neither Starchitect nor Value At Risk are proven at this trip, and the latter's ability to plug on at the finish in the Festival Plate at Cheltenham is not indicative of untapped stamina to my eye. Value At Risk seemed to fail for stamina in the Albert Bartlett Hurdle a couple of years ago, and has been kept to shorter trips over fences thus far. He may do better now, but I'm not convinced, and nor am I certain that Harry Whittington's yard can be considered in form with just one winner since Christmas, which would be a worry for backers of Emerging Force. I fancied Henri Parry Morgan to stop the rot at Cheltenham, but he had no excuses for a tame effort and a further ease in the weights doesn't entice me. My two against the field at bigger prices are Full Cry and Lamb Or Cod. The former was racing over an inadequate trip last time, and had no chance against the speedy Great Field, but ran well when second to Heron Heights at Cheltenham in October. He is better suited to a sound surface than the deep ground he contended with last time. Lamb Or Cod is also better on spring ground, and can be excused an unplaced run in the Kim Muir, at least in part, as he was badly hampered at a crucial stage. His record on good or faster ground away from Cheltenham is very good, and he looks too big with Richard Johnson back in the saddle. Finding the winner of the World’s most famous steeplechase is no easy task. But I wouldn’t be doing this job if I didn’t like a challenge, so let’s have a crack at uncovering this year’s Grand National hero. It’s important to reflect on recent renewals when attempting to solve the Aintree puzzle, though a quick peek over the last decade or so, does nothing to settle my nerves for the task ahead. Last year’s winner, Rule The World, was a 33/1 shot who had failed to win any of his previous starts over fences. In 2015 and 2014 we had winners priced at 25/1, and in 2013 a 66/1 shot caused a mighty upset. Add to those a further pair at 33s and a 100/1 rank outsider, and you begin to appreciate the size of the task. With a field of 40 going to post, I must first attempt to cull the no-hopers from the possible contenders. We have to go back to 1940 for the last seven-year-old winner, suggesting that the younger chasers probably lack both the mental and physical constitution for this marathon event. There’s also a case to dismiss the chances of 12-year-olds, with only one in the last 20 years successful. But it’s likely we’ll have two in the field, and both have the perfect winning profile. Raz De Maree and Bless The Wings have excelled in similar staying chases, with the former runner-up in the Welsh National in December, and the latter filling the same position in the Irish National just 12 months ago. Of course, both have plenty of miles on the clock, but their recent form suggests they both retain plenty of ability. So, with 37 horses still on my ‘contenders’ list, I now turn my attention to chasing experience. It’s no surprise that winners of the great race have been competing in all the usual trials, gaining that vital experience that will enable them to cope in a 40-runner marathon, with 30 fences to conquer. Over the past decade, seven winners had run between 10 and 14 times over the larger obstacles. Rule The World, though a novice and a maiden over fences, had at least gained enough chasing experience, including a second-place finish in the Irish National. Many Clouds had just 10 outings over the larger obstacles before his famous win in 2015, but had won the Hennessy at Newbury several months earlier. If I’m stringent in applying the ‘experience trend’, I am successful in excluding half a dozen or so from my ‘contenders’ list. Unfortunately, this application highlights the difficulty this year in reducing the number of potential winners. Definitly Red, Vieux Lion Rouge and Pleasant Company all fall short of the ideal level of chasing experience, and as such I should put a line through the trio. Yet all three are strongly fancied to go well, with Vieux Lion having experience in the right kind of races to go well tomorrow. For many years, I would have no hesitation in putting a line through those carrying more than 11 stone. Hedgehunter carried a pound more when winning in 2005, though he was an exception at the time. However, in recent years, a combination of factors has resulted in horses winning despite carrying huge weights. The standard of competitors has certainly improved, with the handicaps from top to bottom becoming compressed. Doctor Harper on 10-6 and rated at 143, is likely to be at the bottom of the weights tomorrow. Hedgehunter was rated 144 when winning in 2005, yet carried a lofty 11-1. Three of the last seven winners have carried 11-5 or more, though only Gilgamboa (fourth) carried more than 11 stone to a top ten finish last year. And though Many Clouds lumped 11-9 to victory, only one other carried more than 11 stone to a top dozen finish behind him. It therefore follows that we should still be safe in putting an upper-limit at around 11 stone for the likely winner. If I ruthlessly draw a line just above those carrying 11-1, I can start to focus on the 20 plus contenders that remain on my list. I’m keen on Blaklion for Nigel Twiston-Davies. Last year’s RSA winner has failed to progress to the top-table, but he looks the ideal sort for this. He finished a creditable fifth in the Hennessy Gold Cup, off a mark of 154 back in November. He then ran arguably a career best at Haydock in the Grand National trial, off top weight, when trying to give Vieux Lion Rouge 6lbs. It’s a lack of gears that stops this fella from reaching the top. But he has a touch of class, and looks a thorough stayer. He should go close. Vieux Lion Rouge has done little wrong this winter, and clearly holds strong claims. Both trainer and jockey are adamant that he has strengthened since last year’s seventh-place finish, when beaten a mile by Rule The World. That may be true, and he certainly wasn’t stopping at Haydock last time. He finished with a rattle to win the Becher, and certainly looks a more resolute character this year. It’s right that he’s towards the head of the betting. I’m less convinced by Definitly Red, though he did run well in the Grimthorpe last time at Doncaster. His jumping can be a little patchy, and though he beat Blaklion at Wetherby in December, he was receiving a ton of weight on that occasion. He looks a horse that enjoys a smaller field, and I’d fancy he’ll be harassed into errors tomorrow. One For Arthur looks a thorough stayer and could run into a place. He ran well in the Becher Chase and then stayed on well to take the Betfred Classic at Warwick. He lacks a prep-run, and the stats show that this is certainly a negative. Nevertheless, I think he’ll go well, though he probably lacks the class to win. Paul Nicholls will be desperate for success, as he attempts to cling to his trainers’ crown. Vicente looked a promising sort last year, and ran a cracker to win the Scottish National. But he’s proved a major disappointment this winter, despite conditions often being in his favour. Nevertheless, I find myself drawn to him, as was owner Trevor Hemmings, who bought him in March. He’s worth a few quid at around 25/1. Having discounted those above 11-1, I wish to give a mention to Paul Nicholls’ other leading hope, Saphir Du Rheu. He ran a cracker in the Gold Cup, and is without doubt a classy sort. He’s high enough in the handicap for me, and his jumping has proved an issue in the past. Nevertheless, if he gets into a decent rhythm, he could certainly run into a place. Finally, a horse from left field that could run a huge race at a huge price. I was on Lord Windermere at 33s when he took the Gold Cup in 2014, and I’m unable to pass on the opportunity of backing him at 50s for this. He’s hopeless on soft ground, but is a different beast with conditions suit. His seasonal debut showed promise, and he has the ideal partner in two-time Grand National winner Leighton Aspell. No doubt many of us will be scratching our heads as the winner crosses the line, but you need to be in-it to win-it. I’m all-over Blaklion for the win, and will be taking a punt at Lord Windermere each-way at 50s, and Vicente at 25s. Best of luck to all. The middle day of three, Ladies' Day, and the spectacle is easy on the eye, both on course and on track, writes Rory Delargy. There is no dyed-in-the-wool front runner here (Bigmartre has led on a couple of recent starts over two miles, but isn't certain to be ridden aggressively now stepped up in trip), leaving Crystal Lad just about the most likely pacesetter. But plenty of the field tend to race prominently, and hopefully that means a solid pace is likely. That alone doesn't make the race much easier to solve, but it should mean the hold-up horses aren't especially disadvantaged, and there are one or two at big odds who appeal. A Hare Breath didn't cope with the fences in the Arkle, but he ran a fine race in the Greatwood Hurdle at Cheltenham in November, and could well bounce back now switched to hurdles again, with the step up in trip giving hope for a bit more improvement given that he's a point winner, and has won over 2m5f under rules, albeit in a weak race. Marginal preference in terms of a bet is for Sky Khan, however. Lucinda Russell's gelding is taken to put some uninspiring efforts behind him now that he's back on the big stage. His best efforts over hurdles came at the big festival meetings last spring when placed in the Martin Pipe at Cheltenham and in this corresponding race. He then went on to be fifth of 25 at Punchestown, and is clearly well suited to the demands of big-field handicaps at around this trip. Rated 140 when fourth to Party Rock in this 12 months ago, he has slipped to 130 now, and would have finished closer at Uttoxeter last time but for some interference. That suggested he was beginning to find form, and while more is required, he looks worth risking at a general 16/1. River Wylde ran well when third in the Supreme, and that is just about the best recent form on offer; but it's not outstanding, and there isn't a great deal between the market leaders in terms of achievement, with Mount Mews impressing in quieter waters and possibly helped by missing Cheltenham. Moon Racer's desperate run in the Champion Hurdle merely serves to muddy the waters rather than narrow the field. The former Champion Bumper winner is clearly much better than he showed, and the decision to pull him up means he was spared a hard race, but it's very difficult to gauge where he stands in relation to the others, and that makes the race an unappealing betting medium. The Mildmay promises to be a fascinating rematch between Might Bite and Whisper. The former is the bigger talent, but Whisper is the more honest battler, and has stepped up to the plate here in the past. Given Might Bite always gives the impression that he's capable of throwing it all away, it would take a brave man to back him at 4/7, and if there had to be a bet here, it would be on the wily Davy Russell to get the better of the mercurial favourite as he so nearly did in the RSA. It's possible that one or both of the market leaders will underperform, but that's what the others are hoping for if there is to be a surprise. I was keen to back Sub Lieutenant when the market opened for the Melling Chase, and this superb jumper ought to find the nature of the Mildmay Course right up his street. That said, he's now found his way to favouritism, and the value angle is slightly harder to justify. Still, I'm not inclined to jump ship, and just hope that support for one or two others on the day will make him a backable price again. He's undeniably an improved performer since joining Henry de Bromhead, and his second to Sizing John at Thurles in January was both a highly creditable effort in light of the winner's subsequent wins at the top level, but also better than it looks given that the selection was probably not helped by having to bypass the last fence, on a day when he generally gained ground over the winner at their obstacles. He certainly pushed Sizing John all the way there, and was merely underlining the worth of that form when second to Un de Sceaux in the Ryanair last month. God's Own was almost seven lengths adrift of Fox Norton in the Champion Chase, but looked like throwing down a big challenge until badly misjudging the second last, and that pair are harder to separate than the form lines suggest. God's Own has also gone well here in the past, even if he was somewhat fortunate to win this a year ago, and seconds to Sizing Granite and Third Intention do not represent the acme of achievement, meritorious thought they are. Fox Norton kept on strongly in the Queen Mother, but previous connections didn't peg him as in need of further than two miles, so the jury is out on whether he will find extra for the step up in trip. One of my favourite races in the calendar, the Topham suits bold-jumping horses with the early speed to keep out of trouble, and there can be plenty of hard luck stories. The race tests stamina from the second-last fence, but doesn't particularly suit out-and-out stayers. Last year's winner Eastlake gained his other 11 wins under rules at 17 furlongs or less, for example, and the ability to have been effective in decent races over shorter is not to be underestimated. Go Conquer fits the bill as a progressive chaser who ran well from the front at Cheltenham (Ultima) last month until his stamina ebbed away, and it's clear enough he ought to do better if jumping as well as he did there. He has had problems in that department, however, falling at Ascot in December, and making mistakes next time, so makes only limited appeal at the top of the market. Gold Present has looked quirky, but he's jumped well for a novice this season, and it's hard to knock his second in the Close Brothers Novices' Handicap at Cheltenham. Nicky Henderson has an excellent record in this race, winning it with the relatively inexperienced Ma Filleule and Triolo D'Alene in recent years, and five times in all, with the other trio all owned by Robert Waley-Cohen. He'd be near the top of my shortlist, as would Mr Diablo, who is trained in County Kildare by Philip Dempsey. The 8-y-o picked up an injury in the summer, and was presumably not right when ridden against type at Cork in October, but he bounced back with a tongue tie fitted at Leopardstown a month ago, jumping well, and in control when eased after jumping the last. He looks fairly treated still, and with the tongue tie retained, can be expected to put up another bold show. Gowanauthat is a rank outsider who could be underrated, especially if getting the early lead. The Randox Health Grand National Festival kicks-off today, with Cue Card’s appearance in the Betway Bowl the undoubted highlight. Cheltenham had promised so much for trainer Colin Tizzard. Indeed at Christmas, the Dorset handler had the top three in the betting for the Gold Cup, and many were talking of a ‘blue riband’ clean sweep. Injury to Thistlecrack was a major blow, and when the big day arrived, Cue Card came down at the third last, whilst Native River, though putting up a brave performance, could only manage a third-place finish behind Sizing John. Tizzard’s team suffered another pre-Cheltenham blow, when leading Neptune Novices’ Hurdle contender Finian’s Oscar, was ruled out due to a minor setback. And further frustration was forthcoming, when the fast finishing Fox Norton came within a whisker of capturing the Grade 1 Champion Chase. Last year’s successful Aintree assault was led by Cue Card, with Thistlecrack and Native River adding further gloss to a wonderful few days. Tizzard will be hoping for more of the same, though the protagonists differ slightly. His stable star is favourite for today’s Betway Bowl Chase, having romped to success 12 months ago. Empire Of Dirt may prove to be his toughest challenger, though Cue Card at his best, or anywhere near, would surely win this with the minimum of fuss. And I expect him to do so. Part two of a potential Aintree treble is the Champion Chase runner-up Fox Norton. He runs in the Melling Chase on Friday, and is currently the market leader. This step-up in trip should surely suit the gutsy young chaser, who finished with such a rattle at Cheltenham. He faces tough opposition, especially in the form of Tom George’s nine-year-old God’s Own, who landed this event 12 months back. He was half a dozen lengths behind Fox Norton at Prestbury Park, but arguably has stronger form at Aintree. He’ll also enjoy the trip, and a sound surface, though I can’t see him reversing the Champion Chase placings. Sub Lieutenant will look to build on an outstanding campaign, and could prove a sterner test for the favourite. Runner-up to Un De Sceaux in the Ryanair last time, he filled the same spot behind Sizing John in the Kinloch Brae in January, and ran a cracker when third to Djakadam in the John Durkan back in December. Those performances are outstanding, and I’d expect him to be ridden aggressively by Bryan Cooper, and prove hard to pass. This looks a hugely competitive renewal, with Uxizandre looking to bounce back from a disappointing Cheltenham, and Kerry Lee’s pair of Top Gamble and Kylemore Lough both capable of going close. But it’s Fox Norton for the Tizzard’s that looks to possess the class to come out on top in a battle-royal with Sub Lieutenant. A win there for Tizzard and owners Ann and Alan Potts, will raise hopes of a famous double for connections, when Finian’s Oscar goes for the Grade 1 Mersey Novices’ Hurdle on Saturday. No doubt gutted to have missed Cheltenham, the team have a potential star in this undefeated novice hurdler. He’s been impressive in his three starts under rules, especially when a comfortable winner of the Grade 1 Tolworth Hurdle earlier in the season. This better ground should suit the son of Oscar, as should the two-and-a-half-mile trip. Messire Des Obeaux brings strong form to the table, having finished third in the Neptune behind Willoughby Court and Neon Wolf. Alan King’s five-year-old carries the familiar silks of Simon Munir and Isaac Souede, and is without doubt a classy sort. But I’d be surprised if Finian’s Oscar were turned over, though this is certainly his toughest test to date. A ‘Tizzard Treble’ at the home of the Grand National would be no less than the handler deserves, after such a sparkling campaign. The Cotswolds in March may have proved a little disappointing, but Merseyside in April could once again prove a whole lot more satisfying. He's not a big price, but Top Notch looks the clear pick in the Manifesto. He's probably not been given the credit he deserves for a tremendous second to Yorkhill in last month's JLT at Cheltenham, where a rare mistake at the second last cost him much more ground than he was beaten. It's perfectly possible that the quirky winner would have found more for a challenge, but that effort by the Simon Munir-owned gelding is top notch (pardon the pun) form for a novice, and he has nothing whatsoever to fear from Flying Angel, who was a distance in arrears. Like Top Notch, Cloudy Dream was second to a huge talent at Cheltenham, but he never really challenged Altior in the Arkle, and that performance is inferior to the selection's in terms of absolute form as well as the evidence of the clock. He'll need to improve for the step up in trip to beat an on-song Top Notch, and that is not something he's certain to do judging by his runs over fences to date. Frodon has been superbly placed to pick up excellent prize money this season, and is a credit to his trainer, but this looks much his stiffest task. He's proven over the trip and on the ground, however, and this sound jumper might be the one for forecast bets. Divin Bere has a 5lb swing for a narrow defeat at the hands of Flying Tiger in the Fred Winter, and has the greater scope for further progress, so ought to gain his revenge, but both have their work cut out to live with Triumph Hurdle winner, Defi du Seuil, who looked a performer out of the top drawer with the style of his Cheltenham success. His presence in this contest does make for a tempting each-way book, however, and while Divin Bere is the obvious one to chase the favourite home, the most attractive option could be chancing Landin at a massive 66/1 with Bet365, who offer ¼ odds a place in this. Seamus Mullins' charge was a creditable eighth in the Triumph, and doesn't have a massive amount to find with those who fought out the Fred Winter. He's undoubtedly the fifth most likely winner of the race on paper, but his chance of sneaking into the frame is considerably better than the 16/1+ you are getting with the fixed-odds firm. That comment also applies to Forth Bridge, but the 20/1 with Bet365 is sure to come under pressure early doors. There is no bigger fan of Cue Card than me, but it's become increasingly obvious that he's a more potent force on soft ground these days, and he looked in some trouble when falling in the Gold Cup last month. I'd love to see him bounce back - he was impressive in this a year ago - but he looks desperately vulnerable this time round, and Empire of Dirt really ought to be favourite, accepting the fact that his own Cheltenham performance was flawed. Prior to that fourth in the Ryanair he'd chased home Sizing John at Leopardstown, and he clearly stays three miles on that evidence. He needs to warm to his task rather more quickly than he did at Cheltenham, but there is no Un de Sceaux to take him out of his comfort zone here, and he ought to be good enough to beat a solid, but unspectacular field. Buveur D'Air should get the job done in a field impoverished by the defection of Apples Jade, but there are a couple of factors to bear in mind with him. First, the going at Aintree is probably riding quicker than it did for his win in the Champion Hurdle; and second, he's always been considered a two miler through and through by his trainer, for all he was originally being aimed at the JLT as a chasing option. Neither of those factors set off huge alarm bells on their own, but taken together they make backing Buveur D'Air at short odds a less than appealing option. Balnaslow may have finished behind Pacha du Polder and On The Fringe in the Cheltenham Foxhunter, but he was rather unlucky to have lost out on a place having blundered at the last, and having also lost a shoe. I was left with the feeling that he would have gone very close at this sort of trip. He's been meeting the likes of Home Farm, Foxrock and On His Own in points and hunter chases, and has a solidity of form that is missing from many of the runners in this race. He's far from certain to reverse placings with those who beat him last month, but looks a compelling each-way option given his prominent style of racing, so important over this course and distance. Plenty to consider in a competitive Red Rum, but the pick at early prices is Gino Trail, who may have a reputation as a mud-lover, but has won two from three on good ground (including a point) and was second on the other occasion. He has some excellent form in novice chases this season, notably when failing by just over two lengths to concede 6lb to Buveur D'Air at Warwick in December. Given his sound jumping and consistent record, it beggars belief that he's as big as 16/1 for this, and that's a price that needs taking. Could Thursday at Aintree be the last time we see the wonderful Cue Card on a racecourse? Though nothing has been said publicly, the 11-year-old’s trainer Colin Tizzard, and proud owner Jean Bishop, must be mulling over the option of retiring the wonderful chaser. And should he repeat last year’s success in the Betway Bowl, it would prove a perfect way to bring the curtain down on a dazzling career. Cue Card launched his long and illustrious career with victory in a Fontwell bumper back in January 2010. The four-year-old had ‘quickened clear’ to win ‘readily’, in the style of a talented young horse. A few weeks later, Tizzard and his team were celebrating a Cheltenham Festival success, as the youngster ‘romped clear’ to win the Champion Bumper at odds of 40/1. It was a stunning victory. A year later he returned to Cheltenham, and was far from disgraced when fourth in the Supreme Novices’ Hurdle. In a stellar renewal, the race went to Al Ferof, with Spirit Son second and a young Sprinter Sacre in third. A month later, he then chased home the talented Spirit Son at Aintree in the Mersey Novices’ Hurdle, with Rock On Ruby eight lengths back in third. A decision was then made to send him over fences, and he opened his account with a comfortable win at Chepstow in October 2011, beating Silviniaco Conti in the process. Tizzard had to decide whether to campaign Cue Card at the minimum trip, or target the RSA the following March. A defeat to Bobs Worth at Newbury, when appearing to be out-stayed, and getting tagged on the line, sealed the deal. A young Cue Card was not short of gears, and the Arkle Chase looked the right fit at this stage of his development. Unfortunately for Team Tizzard, a certain Sprinter Sacre was lying in wait, and when the pair met in March there could be only one winner. Cue Card ran a cracker in defeat, just seven lengths off the winner, and miles clear of the remainder. The following season started with a romp in the Haldon Gold Cup at Exeter, before a failed first attempt at three miles in the King George. He took the Grade 1 Ascot Chase en-route to Cheltenham, and understandably dodged a clash with Sprinter, instead taking in the Ryanair Chase. It proved the right decision, as he ran-out an impressive winner at his fourth festival. His next outing, though ending in defeat, was arguably one of his best. He again locked horns with the greatest chaser of his generation, as the pair clashed in Aintree’s Melling Chase. Many remember the race for the way Henderson’s fella performed, but Cue Card was awesome that day. He finished just four lengths adrift of one of chasing’s all-time greats, with the rest of the field out of sight. A stunning victory in the Grade 1 Betfair Chase later that year, saw him arrive for the King George of 2013 as joint-favourite. A certain winner two fences from home, became a three-length defeat at the line, with Cue Card appearing to run-out of gas. Injury prevented him from attempting to retain his Ryanair crown, and when he returned to action, his 2014-15 campaign proved disappointing. A wind-op prior to his return in late-2015 turned his career around, and the nine-year-old Cue Card became unstoppable. With the Charlie Hall and Betfair Chase in the bag, he headed to the King George, and a shot at redemption. In a thrilling renewal, he mugged Vautour in the shadow of the post for a sensational victory. He may have added a Gold Cup to the CV but for a fall three-out, though Don Cossack was a terrific winner. He then hammered a strong field in last year’s Bowl, before a tired looking finale at Punchestown. This season has again proved profitable, thanks to Grade 1 victories at Haydock and Ascot. He was runner-up to his talented stablemate Thistlecrack in the King George, and again came down at the third-last in the Gold Cup. He retains tons of ability, and is the short-priced favourite for Thursday’s showpiece. But with £1,340,230 in the bank, it’s possible that we may be witnessing the final chapter in Cue Card’s incredible National Hunt story. A victory this week at Aintree would without doubt, be one of the season’s highlights. Loved by all, it would surely prove a fitting finale to the career of a jumping legend. You can, if you choose, sensibly construct a case that Aintree is the best National Hunt meeting of the year, writes Tony Keenan. It’s like a post-hype Cheltenham run at a fairer track where the racing is less watered down than at the Festival; with only three days of racing, there are fewer races like the Dawn Run diluting other events. And that’s not even to mention the spectacle of the National fences, easier though they might be nowadays, which remain one of the sport’s great viewing pleasures. The Mullins Aintree project last year produced mixed results. There were wins for the likes of Annie Power, Douvan and Yorkhill but Vautour, Limini and Augusta Kate all got beaten and some of the victories came at a cost. Annie Power hasn’t run since while the Liverpool win seemed to leave its mark on Yorkhill as he met with his only defeat for Mullins at Punchestown next time, falling to seemingly inferior horses like Don’t Touch It and Brain Power. So Mullins seems set to run most of his better ones at Fairyhouse and Punchestown in the coming weeks in the hope of staving off the Elliott challenge in the Irish trainers’ championship, a hope that improved with a graded race treble at Fairyhouse on Sunday but is still rated odds-against by the bookmakers, Elliott currently priced at 1/3 to win his maiden title. Aintree will be a lesser meeting for this, if a less confusing one for ante-post punters. There is no meaningful difference between records of the Irish- and UK-based horses here and one might expect the Irish to do better with selection bias in play: Irish connections would only send their runners over if they believe they hold a meaningful chance… though getting their hands on some precious Ladies’ Day tickets might play a part! One Irish trainer who does quite well however is Henry De Bromhead; his two winners from 17 runners is decent and that’s backed up by six placed horses. He is on record as saying he expects to have quite a formidable team for this week. One could however question the relevance of these broader statistics in light of a Cheltenham where the Irish dominated, at least in terms of raw winners, and perhaps this season’s ‘trends’ will have a great impact on what happens at Aintree. It is the UK trainers that tend to do best at Aintree then and their records since 2010 are considered below. Henderson is the obvious one of the big trainers to stand out, along with Alan King, but Peter Bowen, with a big level-stakes profit and a massive actual over expected, is the most profitable to follow. It seems that the markets struggle to get a handle on his horses here with them often having struggled through the winter. Of those that finished just outside the top ten in terms of winners trained, and did well when looking at the place stats, Gary Moore and Malcolm Jefferson come out well. The latter could run his Arkle second Cloudy Dream in the Maghull where he won’t have to face Altior though the Manifesto seems the favoured option at this point. David Pipe, trainer of the Grand National favourite Vieux Lion Rouge, is the main negative among the major handlers; he’s had three winners at this meeting but it has taken 83 runners to get there for a strikerate of 3.6% and his record with placed horses is poor too. Venetia Williams (0/51 with 2 places) and Charlie Longsdon (0/28 with 1 place) are other negatives, their poor – non-existent actually – win strikerates supported by bad place numbers. Perhaps the most crucial aspect of betting at Aintree this week will be judging Cheltenham form. There’s a lot of mythos around horses having had a hard week little over three weeks previous and the toll it might exact at Liverpool but the facts don’t really bear this out; as a group, horses that ran well at Cheltenham do better than any other cohort at Aintree. Below I have divided the records of different groups at Aintree since 2010 by their last run: Cheltenham winners, Cheltenham placers (second, third or fourth), other Cheltenham runners and the rest. The old KISS (Keep It Simple Stupid!) system seems to work best: Cheltenham winners may well have had hard races last time but more importantly they are just the better horses and thus win the most races. The placed runners have done well, too, though their level-stakes profit is rather inflated by a few big priced winners, Orsippus at 40/1 (2010 Anniversary 4yo Hurdle; third in Fred Winter beforehand), Pineau De Re at 25/1 (2014 National, third in Pertemps) and Oiseau De Nuit at 20/1 (2013 Red Rum, third in Grand Annual). All this brings to mind one of the big conundrums of the national hunt season: if these good jumpers can take quick races well then why don’t they run more often during the winter? Their prolonged absences hurt the sport in terms of spectacle and while connections may voice their reluctance to give their horses hard races on soft ground I have my doubts about that theory. Surely the hardest races come when a horse is asked to run fast, and time and again we have seen the most strongly-run races are at the spring Festivals. And yet, the best horses in most cases seem well able to cope with this, allowing that most if not all will have a summer break afterwards. Prizemoney and prestige as well as the imminent end of the season undoubtedly make trainers willing to run their horses more frequently at this time of the year but some might be better served taking a similar approach throughout the season as a whole which is short enough as it is without self-imposed restrictions on how often a horse might run. There have obviously been high-profile examples of success with sparingly campaigned horses, like Henrietta Knight with Best Mate and Nicky Henderson with Sprinter Sacre last season, but there might be some confirmation bias going on here. Gordon Elliott for one seems less inclined to trust this received wisdom and has been very successful this season with running his horses frequently. Should he ascend to be top trainer in Irish national hunt racing, an outcome rated likely at this stage, perhaps his methods will catch on. I wouldn’t hold my breath though! Should we expect Cheltenham Festival victors to come to the fore at Aintree? The Aintree Festival always comes relatively soon after Cheltenham and this year is no different, with the meetings separated by just three weeks, writes Alexander Peperell. In horse racing terms that’s not that long and it can be asking a lot of a horse to put in another performance out of the top drawer at both Festival meetings. It is plausible that the exertions of a Cheltenham Festival race take more out a horse than other more workaday events, simply because of the ultra-competitive nature of the contests. Therefore the thought of repeating that feat just a few weeks later can be a daunting one. In spite of this, scores of horses attempt the double each year. I have taken a look at both festivals over the past five years to see how win and placed horses at Prestbury Park fared at the Grand National meeting the following month. I have calculated the placings on the basis that 5-7 runners pay two places, 8-15 three places and 16 or more runners pays four places. Looking at this table you can immediately see that it pays to take heed of winners at Cheltenham. 2015 was a bit of blip, but that was also the year with the lowest number of victors lining up at the latter festival. Across all five years an average of 60% of horses that won at Cheltenham went on to be placed or better at Aintree, with 18 (32%) notching the Festival double. The number of placed horses at Cheltenham running at Aintree has steadily increased over the past five years, these stable stars being campaigned aggressively in search of more prize money. 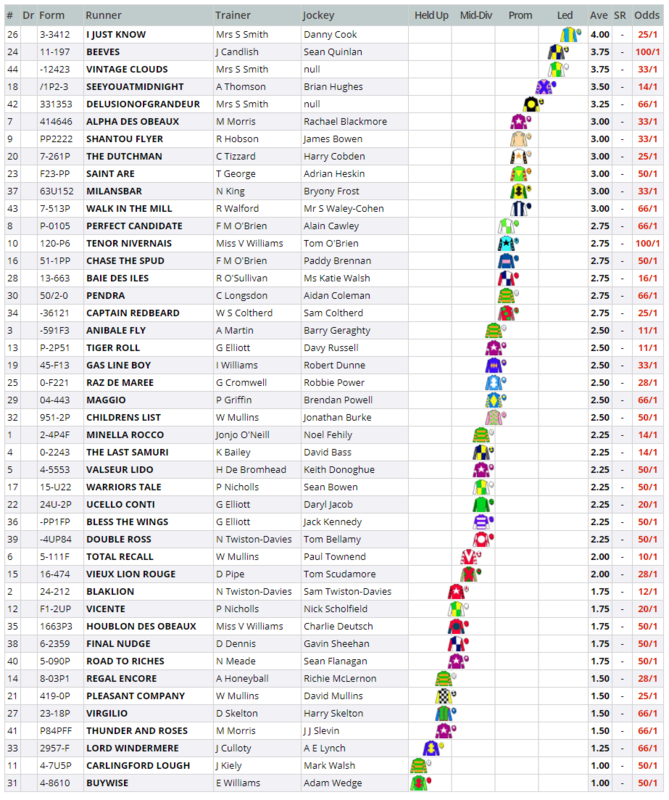 Cheltenham Festival placed horse fare predictably less well compared to winners, but the average of the win and place percentage (right hand) column is a pleasing 45%, testament to the quality and endurance of the horses competing. Taking the samples as a whole it’s clear to see the Aintree success of horses that do well in the Cotswolds: exactly half of the win and placed horses from Cheltenham that compete in Liverpool have gone on to make the frame over the past five years. In terms of specific races, the Liverpool Hurdle has been a lucrative race for Cheltenham winners, with the only time in the past five years it hasn’t gone the way of a same year festival winner being 2015. However, that season's World Hurdle victor was second in the Aintree equivalent. I will be looking very closely at Nichols Canyon in this year's renewal if he shows up. Supreme Novices’ Hurdle horses have done well in Aintree’s Top Novices’ Hurdle with three second places and a third from Cheltenham subsequently triumphant in the latter race; while the Mersey Novices’ Hurdle has been won three times by horses that finished in the frame in the Neptune Novices’ Hurdle. When it comes to picking what to follow from festival to festival, one of the first things I would look for is British-trained placed horses that were behind Irish runners, as the majority of Irish Cheltenham contenders either head to Punchestown or swerve the remaining spring festivals entirely. The likes of River Wylde, Top Notch, Native River, Fox Norton and Claimantakinforgan would be runners to follow. As the Grand National Festival looms, it seems that many of the Aintree winners are right in front of us in the results table from Cheltenham, but it’s still not easy to complete the puzzle. Alex completed a Sports Journalism course at the start of the year and holds a Diploma from the College of Media and Publishing. He has a monthly column in Racing Ahead magazine as well as his own blog. We are now little more than a week away from one of the World’s most famous sporting events, the Grand National at Aintree. It’s a race that has produced legends of the sport, both equine and human. A double-act that stand head and shoulders above the rest, are of course Ginger McCain and Red Rum. McCain was a no-nonsense Southport car-dealer, who took over training duties for a horse that was to become the greatest in Grand National history. Red Rum dominated the marathon event like no other. In a five-year stretch from 1973 until 1977, he was victorious three times and runner-up twice. The horse became a national treasure, opening fairground rides at Blackpool, and even switching on the illuminations. An injury forced an end to his racing career prior to the 1978 renewal, and he enjoyed a long retirement before dying at the age of 30 in 1995. It was only right and proper that he should be buried near the winning post at Aintree, the perfect resting place for the National hero. Returning successfully year after year, in a race that puts a horse to the test like no other, was a truly remarkable achievement. Many have multiple attempts at the Aintree showpiece, though few manage to land a blow on second and third appearances. Some, however, did manage to make their mark in the toughest race of them all, and it’s a period in the mid-2000s that I wish to take a closer look at in today’s piece. Hedgehunter had all the physical attributes to become a terrific staying chaser, and so it proved. Carrying the famous silks of Trevor Hemmings, the classy gelding was trained by Willie Mullins. A fourth-place finish in the Hennessy at Newbury; third in the Welsh National and then winner of the Thyestes Chase at Gowran, appeared the perfect preparation for his assault at the Grand National of 2004. Among the favourites for the race, the eight-year-old jumped and travelled like a dream throughout, and looked the likely winner turning for home. However, stamina quickly evaporated, and he crumpled on landing over the last, leaving Clan Royal and Amberleigh House to fight out the finish. The former almost took the wrong course, having to be dragged back on track nearing the elbow. The latter, trained by non-other than Ginger McCain, took his opportunity, getting up late for a famous victory. If Hedgehunter proved frail in 2004, it was certainly not the case a year later, when he returned with a devastating performance to capture the great race. This time he’d prepped with a win in the Bobbyjo Chase at Fairyhouse, and under a super-cool ride from Ruby Walsh, he sauntered to a stunning success, hitting the line 14 lengths clear. Clan Royal had looked a serious challenger, but was carried out by loose horses at Becher’s Brook when still five lengths clear. Hedgehunter took over in front, and looked the likely winner from then on. Ruby remained motionless until the elbow. It was a colossal performance. He almost won the Gold Cup a year later, losing out to War Of Attrition at Cheltenham. Though lumbered with top-weight, he was still sent-off joint favourite at Aintree, as he attempted to win for the second year in a row. Once again, the JP McManus owned Clan Royal proved a major threat, as the pair jostled for the lead late-on. But heading to the elbow it was an Irish challenger, Numbersixvalverde, that proved the biggest threat. Hedgehunter was unable to withstand the late charge, and came off second best, though lost little in defeat. Clan Royal battled on bravely for third. Hedgehunter’s Aintree story continued in 2007 and 2008, as he attempted to land the prize for the second time. Burdened with top-weight each time, he ran with great promise on both occasions before fading late-on, coming home ninth behind Silver Birch, and then thirteenth to Comply Or Die. That final effort came at the age of 12, and soon after the race connections took the sensible decision to retire the classy warrior. Hedgehunter had amassed prize money of more than three quarters of a million pounds. His Grand National achievements are some way short of the mighty Red Rum, yet many would argue that his Aintree challenge came in a very different era. The history of the great race is littered with heroic efforts from horses that returned year on year. Next week’s renewal will prove no different, with The Last Samuri, looking to go one better than 12 months ago. Kim Bailey’s nine-year-old has the look of a Grand National regular, and another mighty challenge can be expected.